ST. PETERSBURG, Russia ― Two of the world’s most influential women met Friday on the sidelines of the G20 Summit as President Park Geun-hye had a one-on-one meeting with German Chancellor Angela Merkel. Park, Korea’s first woman head of state, has cited Merkel, who is also the first woman chancellor of Germany, as a role model. “In time with the 130th anniversary of the start of diplomatic relationships between the two nations, Park met with Merkel,” said Ju Chul-ki, Park’s senior secretary for foreign affairs and security. Park has attempted to realize a creative economy by boosting venture start-ups and stimulating the convergence between IT and other business areas so that Asia’s No. 4 economy will be able to find new growth engines. Germany has been touted as a country bracing for the concept of a creative economy as its economy is underpinned by small exporters, which boast of unrivaled technological competitiveness. 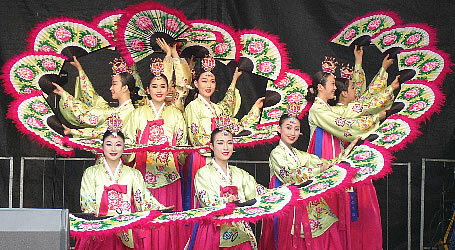 By contrast, Korea Inc. has been represented by large conglomerates such as the Samsung and Hyundai Motor groups instead of small corporations. This has been seen as a potential weakness. Park and Merkel share many things in common. In May, the Forbes magazine published the world’s 100 most influential women with Merkel topping the table for three consecutive years ― Park was listed as 11th. From the perspective of Park who leads one half of the divided Korean Peninsula, she can learn something from Merkel whose country attained national reunification in 1990. They are also close ― Park dubbed Merkel as a role model. 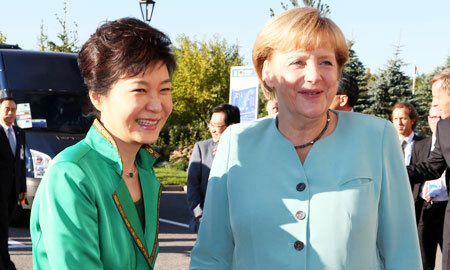 The German chancellor was one of the first world leaders who congratulated Park’s political success. Just after Park won the presidential race last December, Merkel called Park to invite the latter to Berlin in 2013, the invitation was accepted by Park. The official schedule is not fixed yet but political analysts expect that she may fly to Berlin in November when she has a state visit to the United Kingdom. Park also had one-one-one meetings with Russian President Vladimir Putin and Kazakhstan President Nursultan Nazarbayev to discuss ways of strengthening relationships.